I'm using this blog as a platform today to make you aware of something that is utterly astonishing in this day and age. 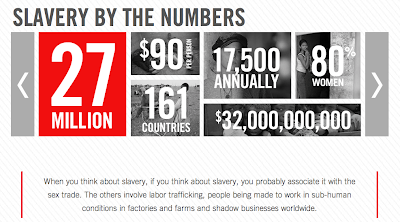 When we think of slavery, we think back to a time long ago to a bitter war or we think of slavery in other countries across the sea. However, probably less than five miles down the road from my house a group of young girls were found enslaved in an apartment. This is a serious issue, happening all around us. I didn't even know about it until today at our church, Cross Point. 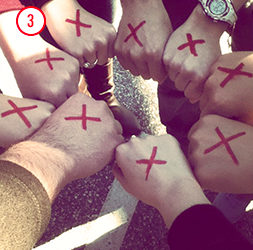 They challenged us to draw a red X on our hands Tuesday, April 9 so people would ask why. Why? Because why would you not do something about it? Why would we continue to let this happen? All it takes is awareness-join me in wearing a red X Tuesday for the 27 million people in modern day slavery and by becoming familiar with the End It website and simply using Facebook, Twitter or a blog to increase awareness.